Diane Illikainen is a teacher from Autrain-Onota school in Michigan's upper peninsula. Diane reached out to our group of radio stations to help her get some promotion so she could have a chance to win $5000 for her school in an online voting competition created by Shopko. I looked at the other teachers competing against her and Diane was from the least populated area, many would feel the odds would not be in her favor. Then I remembered how there was another online competition not too long ago regarding Marquette Michigan and people voting to try to win money for improvements to Lakeview Arena...and they won. Everyone came together like I've so often witnessed before in this area. Diane received notification that she too had won, now how can that be? Well, it's hard to explain if you are listening to this from another part of the country, or the world, and maybe you don't feel connected to those around you. It is about community, people watching out for each other and helping each other. That's one of the things that makes the U.P. of Michigan special, besides all of the natural surroundings. I think it's also how we all are intended to live and maybe in some parts of the world we've lost sight of that. And like my friend from Africa once told me, "It is all about community." So when I heard Diane won I wanted to share her story and let others know there are plenty of good people and good stories out there, the world is not as it seems according to the news agencies. There are many incredible people who lead ordinary lives and once in a while inspire others to become part of their journey. 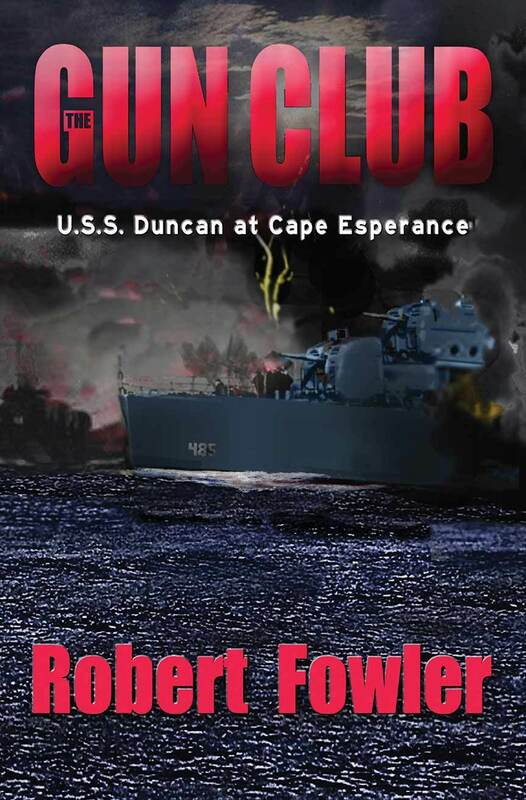 With Veteran's Day just around the corner I got an email asking if I'd be interested in interviewing Robert Fowler and talk about his book "The Gun Club-The U.S.S. Duncan At Cape Esperance." Now, normally this in not a subject I'd have on my podcast, even though I am always curious and would probably talk to anyone about almost anything. But when I went to Robert's website the story grabbed me right away. This is the story of Robert Fowler Sr, the author's father who fought and died in World War Two. Immediately I felt a connection, not from having a family member in the war, well at least not on this side of the Atlantic. My connection was that my Mother was from Germany and my grandmother, a woman I never met, died after an American bomber dumped his remaining bombs on a shelter in Manheim that took the lives of all of those who were just trying to survive. War is Hell, it should never be glorified and I'm not here to do that. I'm also not sore that my grandmother was killed during that event, all things happen for a reason. My mother was never bitter towards the Americans for what happened, it was war as she would often say, three years after the German surrender she would marry a G.I. and move to the states. There are so many forgotten stories that have slipped away into the past. There are so many souls that gave their life for what they believed in. Each has a story and for some reason I am drawn to hear those stories and to pick out little gems if I can. I asked Robert if he ever felt his dad's presence while writing this book and he felt that was a possibility. I asked Robert if he was sad that he never got to know his father and to my surprise he wasn't, and I am grateful that he spoke his truth and said "I never got to know him so it didn't bother me." How honest. Many would have used that question to further their agenda. So I find Robert to be a very honest man who tried to document a forgotten story from World War Two. For me, this interview isn't about the battle, but more about the lives that interacted with each other in a time of complete chaos. And the real kicker for me is Robert's journey to rediscover his own father through the stories of others whom he met fourty years after his father died in a battle that was largely forgotten. From my perspective, and I certainly could be wrong, I sense Robert's father was around him through every step of this process of rediscovery and this was done in love and became healing for Robert and all of his father's buddys that served on the U.S.S. Duncan. This may not be for my typical listeners, so listen at your own discretion. I actually really enjoyed talking to Robert, it was like stepping back into time and being a silent observer. I have great appreciation for those who've made sacrifices, not just from the United States, but from all parts of the world. And I'm not talking just about war, but also those who stood up and died for what they believed in and were truly serving others. I honor all of them.